“In the course of moving around, we were coming across all these incredible stories of initiative, hope, goodness and raw community feeling. And I guess we just wanted more people to hear about them and celebrate together the pride we have in our Macarthur community”, Laul says. 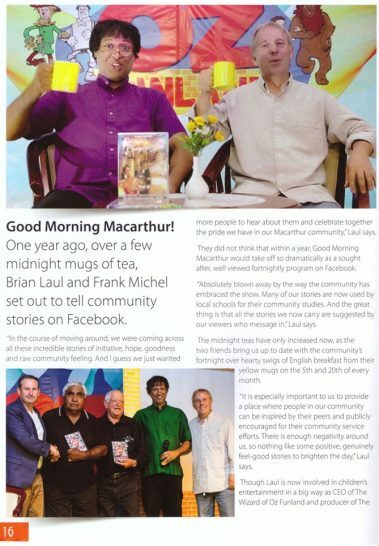 They did not realise that within a year, Good Morning Macarthur would take off so dramatically as a sought after, well viewed fortnightly program on Facebook. “Absolutely blown away by the way the community has embraced the show. Many of our stories are used by local schools for their community studies. And the great thing is that all the stories we now carry are suggested by our viewers who message in”, Laul says. “It is especially important to us to provide a place where people in our community can be inspired by their peers and publicly encouraged for their community service efforts. There is enough negativity around us, so nothing like some positive, genuinely feel-good stories to brighten the day”, Laul says. Though Laul is now involved in children’s entertainment in a big way as director of Oz Funland, secretary of the Children’s Festival Organisation of Australia and producer of The Wizard of Oz Show (that has been performed over 4,500 times worldwide), community storytelling is a throwback to his early career days as a journalist, TV producer/director and award-winning documentary maker. Add to this Michel’s inherent passion for community television and the quirky format of GMM seemed inevitable. Good Morning Macarthur is produced by Rainbow Crossing Incorporated, a not-for-profit body and run entirely by volunteers. The dream is to expand its scope by encouraging young reporters in every suburb, “quite achievable in this digital age where there is a shifting paradigm in the way we tell and consume the news. Social media provides that perfect interactive platform so necessary for grassroots community news”. The GMM team has recently expanded with business coach Rolf Fuchs and cameraman Nick Naunov now on board. They urge university journalism or film making students – and even interested school-goers – to contact them in the coming days as GMM enters its next phase that will add mentoring and documentary production to its storytelling efforts.